For Breakfast this morning I made some Simply Potatoes Shredded Hash Browns, Heated up some Meijer Diced Ham, fried an Egg Sunnyside Up, made a cup of Bigelow Decaf Green Tea. I made a bed of the Hashbrowns in a bow and sprinkled some Sargento Reduced Fat Sharp Cheddar Cheese. Next I put the Diced Ham over top the Hash Browns then put the Sunnyside Up Egg on to top it off. My favorite Breakfast anymore! Not a bad day outside, 28 in the morning and 38 degrees for a high. After Breakfast I went to the local Kroger up the road for a couple of items and the stopped by McDonald’s and picked up Breakfast for Mom and Dad. After Lunch I went over to a friend of mine that was in town, he was staying with his brother. Good seeing him, we’ve been friends since our Freshmen year in High School. For Dinner tonight it’s Seafood and Potatoes. I prepared Fish Sticks, Maryland Style Crab Cakes, and Steak Fries. For the Fish Sticks I used Gorton’s Smart and Crunchy Fish Sticks. Growing up I lived on Fish Sticks. While I was at Meijer the other day I picked up a package of the Gorton’s Smart and Crunchy Fish Sticks. These are coated with Panko Bread Crumbs and to prepare them I’ll be baking them. I first preheated the oven at 375 degrees. I then took a small baking sheet and lined it with foil. Sprayed the foil with Pam Cooking Spray and lined the Fish Sticks up on the sheet. Then baked them for 22 minutes, flipping them over after 11 minutes. They came out piping hot, nice crunch from the Panko Bread Crumb Coating and nicely Seasoned. I really like all the Gorton’s Seafood Products. Easy to prepare and good quality Seafood. Served them with a side of McCormick Tarter Sauce. Then for the Crab Cakes I used SeaPak Maryland Style Crab Cakes, first time using these. Another item I picked up at Meijer the other day. They come frozen to a box, individually vacuumed sealed. To prepare these I preheated the oven to 425°f. Removed the frozen crab cakes from vacuum-pack and arranged on a baking sheet, flat side down. I then brushed them with melted Blue Bonnet Light Butter. Baked for 15 minutes on middle oven rack. Turned the Crab Cakes over and press gently to flatten them. Continued to bake for another 10 minutes. Let them cool for 3 minutes and ready to eat! I served these with an Aioli Sauce that came with the Crab Cakes, excellent Sauce! Very good Crab Cakes, lots of Crab Meat and great Seasoning. Another good item to have in the freezer. For a side I baked some Ore Ida Steak Fries and had a side of Hunt’s Ketchup for dipping.Also baked a loaf of Pillsbury French Bread. For Dessert later a Weight Watcher’s Cookies and Cream Ice Cream Bar. 100% wild-caught Alaskan Pollock breaded in a panko coating. Always crispy, never fried. At 50% less fat than regular fish sticks and just 180 calories per serving, they have all the classic flavor with half the guilt. UNCOOKED. KEEP FROZEN UNTIL READY TO COOK. 2. Spray metal baking pan with non-stick spray. 3. Arrange on baking pan. 4. Bake and flip after 11 minutes. Bake for 21-23 minutes total*. *If cooking more than 15 fish sticks, add 2 minutes to the cooking time. FULLY COOK FISH TO AN INTERNAL TEMPERATURE OF 155ºF OR HIGHER BEFORE SERVING. INGREDIENTS: Minced Alaskan Pollock, breadcrumb coating. Wheat flour, water, palm oil, yellow corn flour, whey, salt, sugar, natural flavor, garlic powder, onion powder, yeast, beet powder (color), baking powder (baking soda, sodium aluminum phosphate), colored with paprika, annatto, and turmeric extracts, xanthan gum, beta carotene (color). – Keep frozen until ready to prepare. – Due to differences in appliances, cooking times may vary and require adjustment. – Caution – Product will be hot! * preheat oven to 425°f. * remove frozen crab cakes from vacuum-pack. * arrange frozen crab cakes on baking sheet, flat side down. * brush with melted butter or margarine. * bake for 15 minutes on middle oven rack. * turn crab cakes over and press gently to flatten. * continue to bake for another 10 minutes. * thaw aioli sauce by placing the sealed sauce packet under running water for about 3 minutes. For Breakfast on this chilly Saturday Morning I Prepared a Cheese Omelet, made with Egg Beater’s Egg Whites and Sargento Reduced Fat Shredded Sharp Cheddar Cheese. I then toasted a couple of slices of Healthy Life Whole Grain Bread, lightly buttered with I Can’t Believe It’s Not Butter. Also had the every morning cup of Bigelow Decaf Green Tea. Cold out this morning, 32 degrees and light frost. The afternoon it got up into the 60,s and sunny. As it warmed up outside I got the leaf blower out and cleaned the deck and around the driveway. After Lunch I went over to spend the afternoon with Dad. He wasn’t having a very good day. He was having a lot of trouble breathing today. He’s been having more bad days than good lately, just keep praying for his recovery. Back home I did a load of laundry for Mom. For Dinner tonight, it’s a Dinner by the oven tonight! 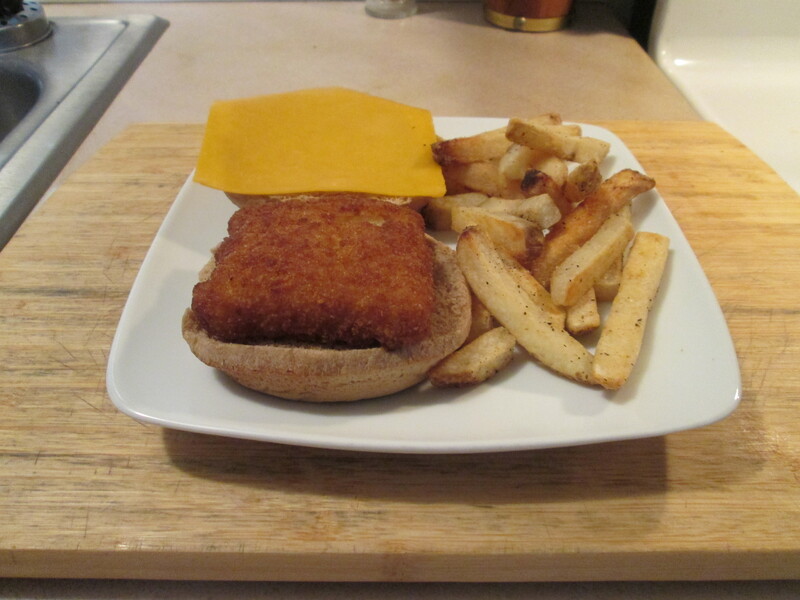 I prepared a Fish Fillet Sandwich w/ Baked Fries. I picked up a bag of the Gorton’s Smart and Crunchy Breaded Fish Fillets at Meijer a while back and had them in the freezer. You bake them from frozen so I didn’t have to thaw them out. To prepare them I preheated the oven on 400 degrees. Then took a small baking pan and sprayed it with Pam Cooking Spray. Laid the Fish Fillets flat in the pan and baked for 24 minutes, I flipped them over after 15 minutes. The Fillets came out perfect! The Breading gave them a nice crunch and they had excellent flavor. They are 190 calories and 25 net carbs per serving which is 2 Fillets. Another great Seafood Product from Gorton’s, and another good one to have in the freezer! Served it a Healthy Life Whole Grain Hamburger Bun along with a slice of Kraft Sharp Cheddar Cheese. For a side I baked up some Alexia Organic Yukon Select Fries. Seasoned them with McCormick Grinder Sea Salt and Black Peppercorn Medley. Baked them at 425 degrees for 16 minutes. They bake up beautifully and seasoned just right, excellent Shoestring Fry! Plus they are only 120 calories and 15 net carbs. For dessert later Jello Sugar Free Dark Chocolate Pudding topped with Cool Whip Free. All the classic flavor with half the guilt. Our Smart & Crunchy Fish Fillets have 50% less fat than regular fish fillets and are never fried — so there’s no need to sweat the 190 calories. Alaskan Pollock fillets, breadcrumb coating. Wheat flour, water, palm oil, yellow corn flour, whey, salt, natural flavor, garlic powder, onion powder, sugar, yeast, baking powder (baking soda, sodium aluminum phosphate), beet powder (color), colored with paprika, annatto, and turmeric extracts, xanthan gum, beta carotene (color). For Breakfast this morning I toasted a couple of Eggo Waffles, lightly topped with butter, and had my morning cup of Bigelow Decaf Green Tea. Already 49 degrees this morning, warmest in a while. For the day it was mostly cloudy and a high of 70 degrees, about time! After Breakfast I went to Kroger to pick up some groceries for Mom. She was out of a lot things and dad will be home tomorrow after being gone 2 months in the hospital and rehab. Be great to have him back home. After Lunch I pulled out my mobility cart from the shed and cleaned it up. Then swept shed out. I also grabbed the leaf blower and cleaned of the deck and around the driveway. Kept it simple for Dinner tonight. I made some Crunchy Breaded Fish Sticks w/ Whole Grain Mac and Cheese. So it’s Fish Sticks tonight! 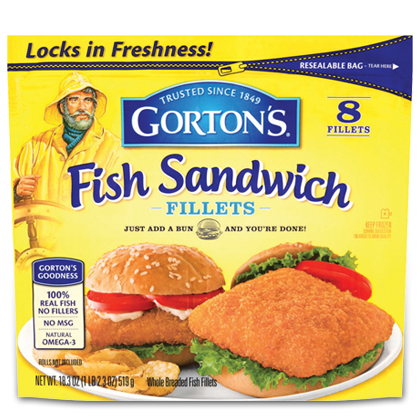 I’m using Gorton’s Smart and Crunchy Breaded Fish Sticks. Growing up I lived on Fish Sticks. When I was at Meijer the other day I seen these in the frozen foods and bought a package of them and the Gorton’s Smart and Crunchy Fillets. These are coated with Panko Bread Crumbs and to prepare them I’ll be baking them. I first preheated the oven at 375 degrees. I then took a small baking sheet and lined it with foil. Sprayed the foil with Pam Cooking Spray and lined the Fish Sticks up on the sheet. Then baked them for 22 minutes, flipping them over after 11 minutes. They came out piping hot, nice crunch from the Panko Bread Crumb Coating and nicely Seasoned. I’ve got another great item for the freezer, a good one to have on hand. Served them with a side of McCormick Tarter Sauce. For side to go with the Fish Sticks I prepared some Kraft 50% Whole Grain Mac and Cheese. I normally have the regular Mac and Cheese but I seen the 50% Whole Grain at Meijer and picked up a 4 pack of them. It comes in a microwavable plastic container. To prepare it just remove the lid, add water and stir, microwave for 3 1/2 minutes, and stir in the packet of cheese sauce. And you have your Mac and Cheese! Another nice item to have in the pantry. Easy to prepare, nothing like good old-fashioned Kraft Mac and Cheese! Container makes 1 serving. Love these Kraft Mac and Cheese! Seafood and Mac and Cheese are just a natural pairing. For dessert later a Jello Sugar Free Dark Chocolate Pudding. Always crispy, never fried. At 50% less fat than regular fish sticks and just 170 calories per serving, they have all the classic flavor with half the guilt. Minced Alaskan Pollock, breadcrumb coating. Made with 50% whole grain. 19 g of whole grain per serving (nutritionists recommend eating at least three one-ounce equivalents of whole grain products per day [about 16 g whole grain per serving or at least 48 g per day]. One serving of this product contains 19 g whole grain, approximately 39% of the minimum daily amount). Ready in 3.5 minutes. Just add water. For Breakfast this morning I Scrambled a couple of Eggs that I sprinkled with Sargento Shredded Sharp Cheddar Cheese. Then I toasted a couple of slices of Healthy Life Whole Grain Bread, lightly buttered with I Can’t Believe It’s Not Butter, and my morning cup of Bigelow Decaf Green Tea. Finished up some laundry for Mom. After Lunch I went and spent the afternoon with Dad. He’s doing somewhat better but still a long ways off for coming back home. Back home I took a nap, just still not feeling up to par. Really didn’t feel like cooking but I still wanted a hot meal. So I took the easy way out, I prepared Crispy Battered Fish Fillets w/ Cheddar Potato Bake and Baked Multi Grain Loaf Bread. Couldn’t get more easy to prepare my Dinner tonight, used the microwave and the oven! I prepared Crispy Battered Fish Fillets w/ Cheddar Potato Bake and Baked Multi Grain Loaf Bread. For my Fish I used Gorton’s Crispy Battered Fish Fillets. Good Fish, already seasoned and battered. To prepare it I preheated the oven on 425 degrees. i used a small baking pan, sprayed it with Pam Cooking Spray. I baked the fillets for 25 minutes, flipping them over after 12 minutes. The fillets came out perfect! Nice size fillets and lave the seasoning and batter. Then to go with my Fish I prepared a Stouffer’s Cheddar Potato Bake. Another easy to prepare and delicious dish. To prepare this one I’m using the microwave. It comes in a microwavable tray. I just slit the film cover on the tray and microwaved it for 6 minutes, Done! I love this side by Stouffer’s! Delicious Potato Dish, really like the bread crumb topping. I also baked a quarter loaf of the La Brea Multi Grain Loaf Bread. Fish, Potatoes, and Baked Bread! I’ll take this easy prepared meal anytime. For dessert later a Weight Watcher’s Cookie and Cream Ice Cream Bar. Made from real, simple ingredients and dipped in our freshly mixed batter for an authentic taste, these flaky white fillets are a classic favorite that’s sure to please the whole family. Ready from the oven in 25 minutes. Plus, Gorton’s Crispy Battered Fish Fillets are available in a stand-up resealable bag for added freshness and convenience! 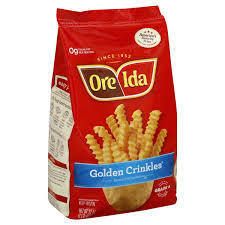 Ingredients: Potatoes, Skim Milk, Water, Cheddar Cheese (Milk, Cheese Cultures, Salt, Enzymes, Annatto Color), Soybean Oil, Bread Crumbs (Wheat Flour, Sugar, Yeast, Soybean Oil, Salt), Bacon (Cured with Water, Salt, Sugar, Smoke Flavoring, Sodium Phosphate, Sodium Erythorbate, Sodium Nitrite), 2% or Less of Modified Cornstarch, Canola Oil, Bleached Wheat Flour, Onions, Sea Salt, Mono- & Diglycerides, Spice, Seasoning (Celery Salt, Spices and Coloring). For Breakfast this morning I fried 2 Jennie – O Turkey Breakfast Sausage Links, Scrambled 2 medium size Eggs, toasted a slice of Healthy Life Whole Grain Bread (lightly buttered), and had the morning cup of Bigelow Decaf Green. Life is good! After Breakfast I started Mom’s laundry for her and then did some light cleaning around the house. Today is use it or lose it day! Our garbage runs tomorrow so any leftovers have to be used today or its in the garbage. Not that many today. Outside it’s another beautiful Fall Day out, sunny and 67 degrees. It was 40 degrees this morning, a bit cooler. Anyway it was on outside to do some cleaning. Lot of leaves already this year. Got the leaf blower out and cleaned the deck and driveway areas. Then I installed a new outdoor thermometer on the shed, looks good. Had everything done by Lunch so after Lunch I got the cart out for a while this afternoon., really beautiful out today. For Dinner tonight I tried a new Item I came across Gorton’s Potato Crusted Cod Bites. Tonight its Potato Crusted Cod Bites w/ Mac and Cheese. While at Kroger I came across a new item, Gorton’s Seafood Appetizer Potato Crusted Cod Bites. These must be a fairly new item because they are not listed on the Gorton’s website. So, they come frozen in a box of 28 pieces. The box description reads; Bite-sized pieces of white flaky cod fillets in a potato coating. Sounds good to me!There’s 8 pieces per serving and their 180 calories and 16 net carbs per serving. To prepare them; Preheat the oven to 425 degrees. Arrange the Cod on a foil lined baking sheet. Then bake 17-19 minutes, flip after 12 minutes. The internal temperature of the Bites should be at 145 degrees. Mine took a full 19 minutes. They come out golden brown and delicious! They were seasoned perfectly, I’ll keep a box of these in the freezer. Great for Snacks, Lunch, and Dinner as I’m having tonight. To go with the Cod Bites what better than Mac and Cheese! I used Kraft Macaroni and Cheese – Triple Cheese. It comes in a microwavable plastic container. To prepare it just remove the lid, add water and stir, microwave for 3 1/2 minutes, and stir in the packet of cheese sauce. And you have your Mac and Cheese! Another nice item to have in the pantry. Easy to prepare, nothing like good old-fashioned Kraft Mac and Cheese! Container makes 1 serving. For dessert tonight a bowl of Breyer’s Carb Smart Vanilla Bean Ice Cream topped with Smucker’s Sugarless Chocolate Fudge Topping. Had an early Breakfast and went to Kroger for a couple of items. Stopped by McDonald’s and picked Mom up something for Breakfast and home. Caught up on some house work and then went to the rehab center to see Dad. He’s just not looking very good, I’m starting to get worried. Back at home I baked some Pillsbury Nut Quick Bread. I baked them in mini loaf pans. Dad loves this so I’ll take him a couple of them over on Sunday. 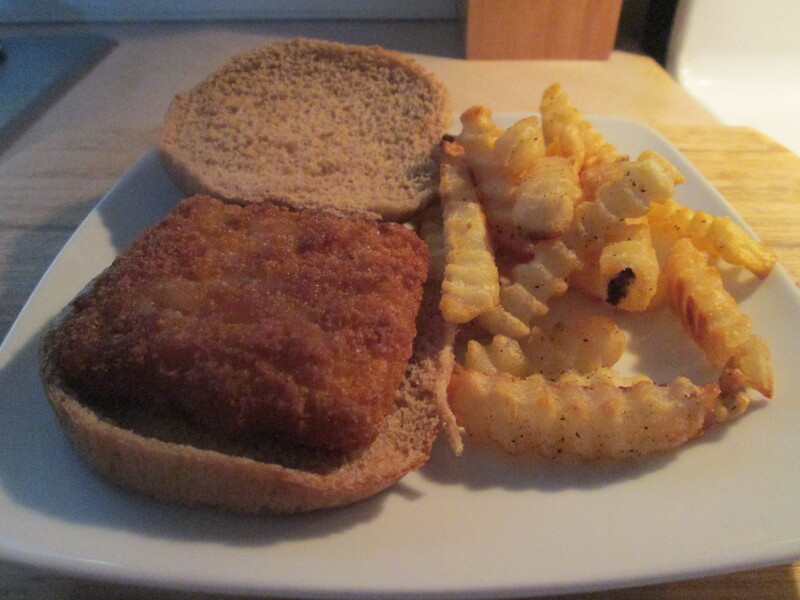 For dinner tonight it’s a Fish Sandwich w/ Baked Crinkle Fries. I used Gorton’s Fish Fillet. They come frozen just bake at 400 degrees and serve. Served it on a Kroger Lite Wheat Bun and topped with some McCormick’s Tarter Sauce. Excellent frozen fish as all the Gorton’s Seafood Products. Then for a side I baked some Ore Ida Crinkle Fries and had a side of Hunt’s Ketchup for dipping. For dessert later a Jello Sugar Free Dark Chocolate Pudding. Crunchy breaded fillets that are the perfect size and shape for sandwiches. Just add a bun and you’re done! Talk about easy. And delicious. And satisfying! I had my eye exam for Glaucoma early this morning. It took about 1 1/2 hours for everything but it came back negative! No signs of Glaucoma. The Doc said the reason I’m getting false reports on the eye tests is that my Cornea is really thick, which gives the tests for Glaucoma a false reading. So a second health care scare comes back negative! Very humid out with afternoon heavy showers moving in. Not much going on for the day, finished up some more laundry for Mom. For dinner tonight it’s a Fish Sandwich w/ Mac and Cheese. 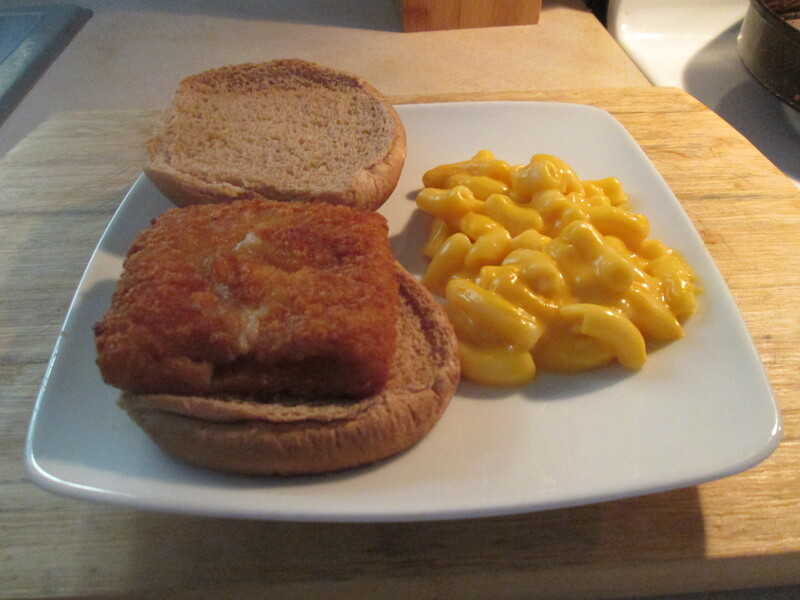 Sort of a stressful day so I wanted any easy prepared meal tonight, so it’s a Fish Sandwich w/ Mac and Cheese. Using the oven and microwave doesn’t get much easier than that! I used Gorton’s Fish Fillet that I baked at 400 degrees. I served the Gorton’s Fish on a Kroger Lite Wheat Bun. Then for a side I microwaved Stouffer’s Classic Mac & Cheese Mac Cup. Frozen individual Mac Cups, just microwave and serve. Finally a great tasting Mac and Cheese in a single serving cup! Tastes great, excellent Cheesy Mac. For dessert later a Healthy Choice Dark Fudge Swirl Frozen Greek Yogurt. Stouffer’s Classic Mac & Cheese Mac Cups are just the right size of delicious Stouffer’s Mac & Cheese. It’s been one rainy day in the neighborhood today. It was in the 60’s with a little burst of sunshine every now and then between storms. After getting a few things done around the house I ventured to Kroger. I was able to get in without getting rained on but leaving was an adventure, it was pouring the rain. By the time I got everything loaded in the car I was soaked, and would have been a lot worse if not for some passing West Chester Firemen. They helped me load everything and took the electric cart back in for me. And Kroger was packed, every register was opened and had several people in line at each of them. I guess people were getting their groceries for the upcoming Easter. So tonight for dinner I’m having a Fish Sandwich w/ Baked Fries. 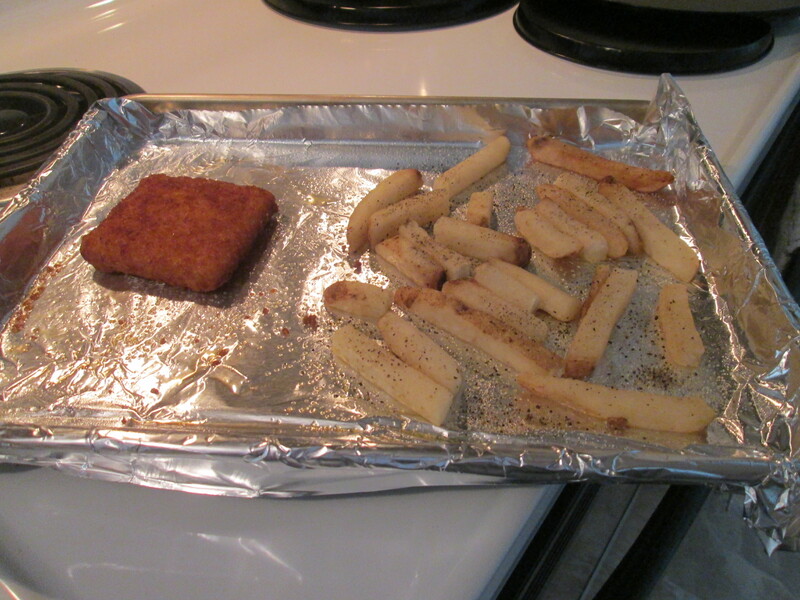 I used a Gorton’s Fish Fillet that I baked along with some Ore Ida Simply Cracked Black Pepper and Sea Salt Country Style Fries. Baked both at the same time both at 400 degrees. I served the Gorton’s Fish on a Kroger Lite Wheat Bun and topped the Fish with just a little Tarter Sauce and a slice of Sargento Ultra Thin Sharp Cheddar Cheese. With the Fries I had some Hunt’s Ketchup for dipping. Frozen foods sure come in handy for last minute meals or on those days where you just don’t feel like cooking a big meal! For dessert later a Healthy Choice Dark Fudge Swirl Frozen Yogurt. Later!